I’m keepin’ it real right now by saying I don’t ride a bike around town. I love my car and am not comfortable enough on a bike to coexist with Silicon Valley car traffic. I wish I was, as the whole “spare the air” thing is a lovely idea. Not to mention the exercise! I’m sure I’d instantly drop pounds if I biked everywhere. 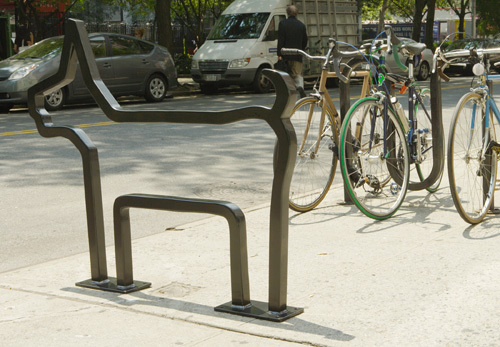 And what about the cool bike racks popping up? Here are a few that are making me reconsider the whole car thing. I remember carrying a smaller version of this comb in my painter pants all through the 7th grade so I could brush out my Charlie’s Angels feathers at any given time. 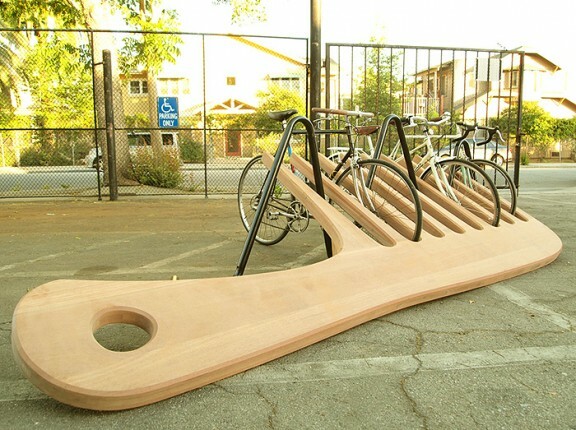 Artists Joshua Howell and Kagan Taylor of Popup Design turned this iconic comb into a fun and functional bike rack. I dig it! 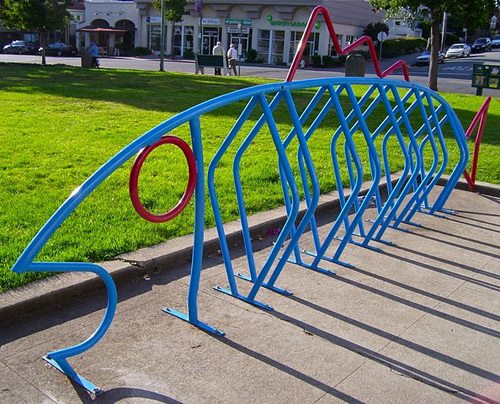 Wouldn’t it be fun to park your bike on a colorful fish every morning? The kids at a the Piedmont Avenue Elementary School get to do just that every day. I love the bright colors and fun shape. We all know dogs are our loyal buddies, so your bike will be in good hands (paws?) on this dog bike rack. Musician David Byrne is a long-time bicyclist who has designed bike racks for various New York neighborhoods. This one was my favorite! I also did a little research on the Silicon Valley Bicycle Coalition website, where I found lots of good info for biking around the area. I’m going to pump up the tires on my bike and give it a try this weekend. I’ll let you know if I’ll be ditching my car in the near future.